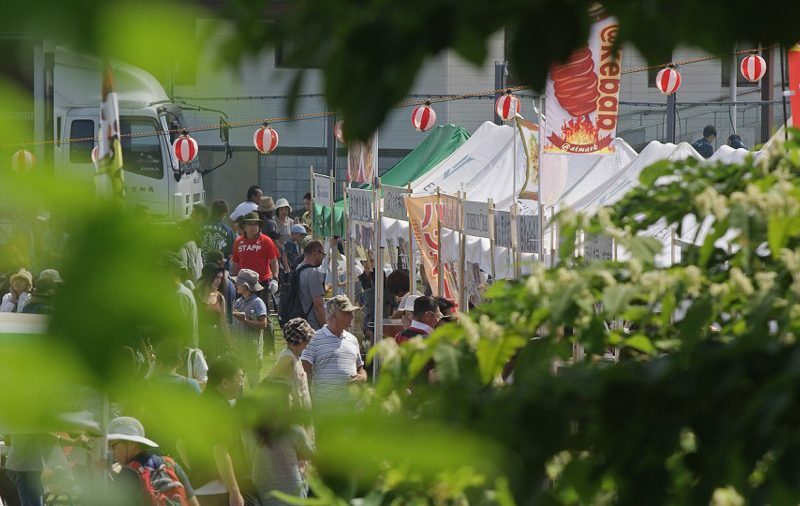 The annual Hirafu Matsuri was held Saturday night and just like the town itself this festival gets bigger and better each year. This matsuri differs from the others in the region for a number of reasons but the most apparent is the number of foreign (Gaijin ) residents in attendance, the other thing that stands out is the swarms of children who seem to be having the time of their lives. Most of the good local businesses have a stall and the closely placed nature of the stalls compresses everyone into the available space and from shortly after opening till the very end it’s packed. There was a number of different performances by everyone from the local school bands right through to the show stealing fire dancers whose display had the entire crowd awestruck, Rhythm had a cool pump track there for people to have a go on, Ki Niseko Hotel had the worlds cutest mechanical sheep giving rodeo style rides for the kids, there was a chance to win a Gentem snowboard, faux sword fighting, Parqour, pop-gun shooting, shave-ice, many different types of food, cold beer and an abundance of smiles creating an atmosphere that floated around the late summer air for everyone to enjoy. This Matsuri culminates with fireworks set to Taiko drumming and this year did not disappoint. Looking back up toward the resort and the lights of the new Aya Niseko hotel or out past the drummers to the omni present shadow of Yotei-zan it was easy to feel just how fast the Niseko region is developing and why it is considered one of Asia’s best places to live or holiday. Less than 100 days till the lifts spin now and Niseko trades the green coat of Summer for the white coat of Winter.